​National Versatility Ranch Horse Association! NVRHA is a 501(c)(3) tax-exempt corporation whose primary objective is to provide an educational, fun and safe opportunity for amateur riders to improve their horsemanship while focusing on the skills a typical horse on the ranch would be expected to perform. NVRHA is a starting place for anyone interested - at any level, with any horse - and still provides an opportunity for those wishing to take competition to the next level. 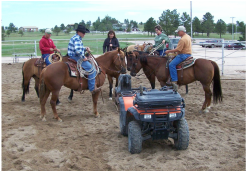 ​NVRHA's mission is to raise awareness of, and appreciation for, the versatility of the ranch horse and to foster the preservation and enhancement of western culture and heritage. To provide a program and place for showcasing the ranch horse and will maintain a strong link among breed associations, the ranching community, the professional horseman and versatility ranch horse riders. 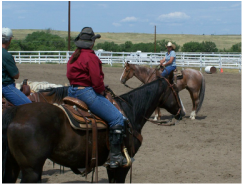 To provide classes to cover skills that the ranch horse would need in the ordinary course of working on a ranch. To provide competitions for participants to showcase the skills learned in clinics and to heighten the awareness of ranch horses in a fun and learning atmosphere are held in conjunction with the educational clinics. NVRHA's vision is to be available for years to come to continue bringing horsemen and women together from all walks of life to experience the ranch horse culture and heritage in an atmosphere of education, relaxation and overall fun in learning that is National Versatility Ranch Horse Association. NVRHA has a two-tiered point system that rewards riders for their achievements. Click Reward Achievement for more information.